Posted on February 27, 2019 by in Sports and tagged Saegertown Basketball. The Lady Panther basketball team looks to take down Maplewood in the district semifinal game tonight at Meadville High School. This will be their third bout against the Tigers this season as well as a tiebreaker, as they have split the first two games with a win apiece. A win tonight would place them in the district final game on March 2. Come out and support the Lady Panthers tonight at 7:30 p.m. You can also follow the action on Twitter @PantherPressSHS. Posted on January 25, 2019 by in News, Sports and tagged 100 wins, Saegertown Basketball. Coach Greg Molnar celebrated his 100th win on January 12. Saegertown Basketball Coach Greg Molnar recently claimed his 100th varsity basketball win against the Tidioute Charter on Jan. 12. The 2018-19 season marks Coach Molnar’s eleventh season at Saegertown and his team is currently 8-7. With the win, Coach Molnar takes his place among three other varsity basketball coaches in Saegertown’s history to achieve 100 career wins. The Saegertown community, however, responded enthusiastically. After Saegertown’s win over Tidioute 48-43, Coach Molnar was surprised by players and fans who attended the match with a confetti cannon and a sign recognizing his accomplishment. Mr. Molnar joins famed Saegertown basketball coaches Merle Darcangelo, Chuck Swick, and Dean Henderson as a part of the “100 win club.” Coach Molnar currently has 103 wins and has the chance to potentially challenge the current coaching win record of 109 wins held by Merle Darcangelo (109-42) and Dean Henderson (109-104). For more information on the history of Saegertown basketball, click here. The Saegertown varsity boys basketball team will make its next appearance tonight at 7 p.m. at Union City. Posted on February 16, 2018 by staceyanderton1	in Media, Sports and tagged Saegertown Basketball, Saegertown High School. Doing the right thing when the opportunity presents itself is one of the unspoken rules of being a coach. That is exactly what Saegertown boys basketball coach Greg Molnar did on Dec. 22 at Iroquois High School. With a definite loss in sight for the Panthers, Iroquois basketball coach Brad Breese substituted physically challenged junior Jared Anderson into the game, hoping he could score his first points in his varsity career. With less than two minutes left on the clock, and the score 71-32, Molnar told Breese to call a timeout. He knew that Anderson’s best chance at scoring was to shoot from the foul line. Working according to plan, Saegertown recovered the ball, and the referee blew his whistle signaling a technical foul. Anderson went to the foul line. Iroquois player Jared Anderson takes his first of two shots at the line after Saegertown Coach Greg Molnar receives a technical foul. At this moment, the atmosphere of competition in the gym transitioned to one of emotional camaraderie. After Anderson missed the first free throw, the gym fell silent for his final shot. Once the ball left Anderson’s hand, it banked off the backboard, and swished. Before the ball even hit the floor, the crowd erupted in cheers that lasted for what seemed like minutes. Anderson also scored the final shot in the game, taking his total points for the evening to three. Anderson plans to attend Edinboro University for either sports medicine or management while also playing on a wheelchair basketball team. Iroquois Assistant Principal Jeannene Willow was also impressed by Saegertown’s sportsmanship. “That was certainly my favorite game of the season this year. I really thought it showed a lot of class on Saegertown’s part. I’m going to remember that game for a long time,” Willow said. Posted on February 3, 2015 by staceyanderton1	in Sports and tagged Saegertown Basketball, SHS. 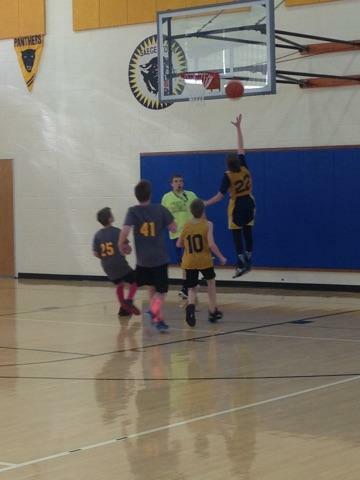 Max Fuller going up for a layup in his recent game on Saturday against Maplewood. Photo contributed by Becca Siple. A fifth and sixth grade boys basketball league was brought to Saegertown from Cambridge 16 years ago by Dan Bidwell, who coached the program along with Tim Wilson and Bob Beatty. The men each had kids who participated, and as their children would enter the high school, the parents would stop coaching and leave it in the hands of another set of parents. Todd Siple and Jim Amy were the most recent coaches, and as of 2014, they left it in the hands of Brant Fuller and Kelsy Reisinger. The program aims to teach young kids the basic fundamentals of the game and prepare them for their high school career. This year there are two fifth grade teams and one sixth grade team. Mr. Fuller and Ms. Reisinger have spent many hours preparing the boys for game time. Teams from Cambridge, Fort LeBouf, General Mclane, Union City, and Maplewood participate in the program. They play on Saturdays, and high school basketball players volunteer to referee and work the scoreboard.